Bengaluru, Sep 4 2017 : Accusing the Congress government of trying to curb "Mangaluru chalo", a bike rally organised by its BJP Yuva Morcha in protest against the killings of Hindu activists in the coastal districts, state party leaders today met Home Minister, insisting it should be allowed. The BJP leaders alleged that the government was creating a situation of an "undeclared bundh", with an intention to stop the rally and asked the government not to stop the rally, being held democratically. "We have no objections to do a rally...we have asked police to ensure that there is no disturbance to law and orderand public," Chief Minister Siddaramaiah said. As rally will commence from different parts of the state tomorrow and with no permission yet from the police, a delegation led by Leader of Opposition in the Assembly Jagadish Shettar, Council Opposition Leader K S Eshwarappa, Former Deputy Chief Minister R Ashoka and others today met newly appointed Home Minister Ramalinga Reddy. While seeking cooperation for the success of the rally from the government, the leaders expressed their intention to go ahead with it "at any cost." "As a responsible national party when we are organising a protest democratically within the framework of law, it is our duty to inform the government...it is the duty of the government to provide protection to our party workers," Shettar said after the meeting. Pointing out that while in government, BJP had ensured protection to Congress organised padyatra against the government, he said, "we have asked the the Home Minister to ensure the same." Assuring of cooperation in ensuring peace from BJP’s side, Shettar said "in case you are unable to provide protection, or police indulges in high handedness to stop the rally by arresting our workers it will bring a bad name for the government, and it will be responsible for the consequences. ", he said. "We all leaders will also be participating in the rally, and no one can stop it, so we have requested government to cooperate," he said. The bike rally has been organised by Yuva Morcha against the alleged murder of 18 Hindu activists and repeated incidents of violence against them. The rally is expected to commence from Bengaluru and Hubballi tomorrow and from Shivamogaa and Mysuru on September seven. Senior party leaders including state unit chief B S Yeddyurappa will take part in the rally at Mangaluru on September seven. Speaking to reporters after the meeting, Reddy said the area SP and DCP have asked for clarifications on how many people will participate and other details on the basis of which they will decide. Highlighting the traffic issues as it is a bikerally, he said he has suggested BJP to hold an event inManagaluru itself, and added that the government did not want any untoward incident happening. BJP MP Shobha Karandlaje said it was not her party, but the ruling Congress which was trying to disturb peace in Mangaluru by making efforts to prevent the rally. 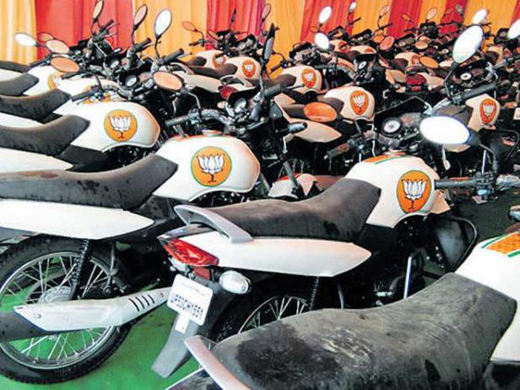 "Not at all, we are not trying to disturb peace by holding bike rally, but it is the Congress, for we are going to hold our dharna peacefully," she told reporters after a BJP meeting attended by State Party incharge and Union Minister Prakash Javadekar here. Karandlaje said BJP is not against Muslims and any other religion, but against "anti-Hindu" policies of the Siddaramaiah government, which is fomenting communal tension in Mangaluru region. She said the Siddaramaiah government is making efforts to stop ’Mangaluru Chalo’ rally because it is afraid of its anti-Hindu policy consequences. "By holding the rally, we are going to expose the anti-Hindu policy of Siddaramaiah government, and that is why Congress is stopping us from doing it. The vehicles are all set for the rally, but the public have to face a trough time due to traffic jam on this day.